Events & Blog: CHEWEE GOT THE PART OF "BULLSEYE"
CHEWEE GOT THE PART OF "BULLSEYE"
Chewee ACED his audition for the part of "Bullseye" in the play "Oliver Twist". 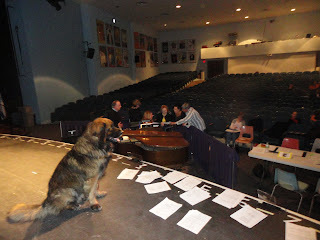 Chewee followed all the directors commands and barked on cue. As you can see the script was in front of him but, he knew his part by heart and didn't even have to read from it. Chewee begins his rehersals and the play will start in May. Zanzibar and Chewee are ready fot the PARADE!!! St Patricks Day Parade is COMING!! !